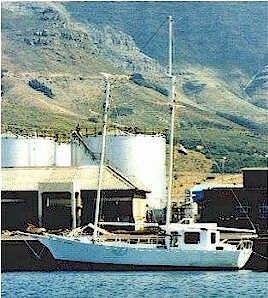 The client who commissioned this boat originally approached me for a cargo version of my Hout Bay 50 gaff schooner. That design did not have sufficient displacement to carry the load desired so a new design was evolved. The gaff schooner rig was retained for economy as the client wanted to owner build and fabricate all components himself. A marconi schooner rig would work just as well. Construction is steel using 5mm hull plating and 3mm deck plating over longitudinal stringers and transverse frames. Steel bulkheads separate the interior into four main compartments. The hull skin extends above the deck all round to form bulwarks. Hull form is multi-chine, with the upper chine radiused to give the hull a round bilge appearance when afloat. Stability calculations showed that it would only be possible to provide proper sailing stability for a limited cargo weight range if all ballast was fixed in the keel. If stability was correct for full cargo she would be too tender when empty. Conversely, if stability was correct when empty she would possibly break her rig when fully loaded due to excess stability. The final solution was the use of a small amount of ballast in the bottom of the keel and the entire volume under the hold (excluding that used for fuel tanks) turned into water ballast tanks. Filled for lightly loaded upwind voyages, they can be emptied at other times to optimise stability. A side benefit is a reduction in displacement with resultant reductions in sailing times and fuel costs. The fin keel is given over entirely to fuel tanks with the exception of the lead ballast volume. Tankage is split into three independent tanks with a combined capacity of 3000 litres (1090 US gals). Range under her Perkins T6.354M 145hp motor varies with the throttle settings and cargo load. At 1500rpm and half load, range will be 2600 miles at 6.5 to 7 knots. The machinery space is under the wheelhouse. Cargo hold volume is 43cub.m (1520cub.ft) with a flat floor area of 14sq.m (150sq.ft). Designed waterline as shown on the drawings allows for 10 tons of cargo. With 25 tons of cargo, freeboard is such that she has sufficient reserve buoyancy for all sea conditions, without being excessively wet on deck. Accommodations allow for a crew of two to live aft, with an additional berth in the workshop forward of the cargo hold. The navigation table is in the wheelhouse, as well as a small galley and settee. The head is accessible from the aft sleeping quarters. The gaff schooner rig has double topmasts to allow area to be increased for light air work. It uses steel tubes for the lower masts and hollow timber for the other spars. The fore boom and its peak halliard can be used for handling light to medium weight cargos through the large hatch situated between the masts. This design is well suited to carrying cargo, whether it be in the form of small cars, machinery, canned food or whatever. It is also adaptable to commercial fishing, diving or salvage work. Follow these links to the list of drawings, material list and stability curves in different load conditions for this design.